Availability Crown Green Bowler Discount Centre - the home page of this site lists charges for delivery. 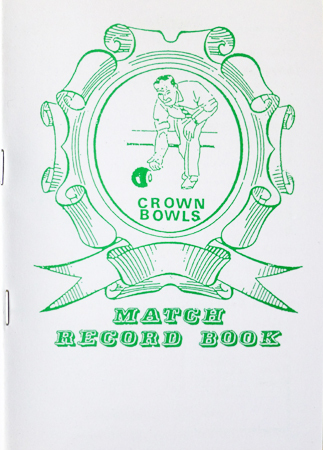 Synopsis As the title suggests this is a record-keeping booklet for crown green bowlers to maintain their records of league and cup matches, 32 of the 56 pages being given over to a standard format of Home/Away; Date; Match (League, Cup, etc); Venue; Score (Home and Away Teams); Result; Captains; and Playing Record to Date (Played, Won, Drawn, Lost, For, Against, Points). Other pages include ones for Memoranda (Club Name, Address, Tel No, Playing Venue, etc), Opponents (Team, Contact), Players' Subscriptions (Date, Sub, Signature), Club Accounts (Date, In, Out, Balance) and Aggregates (Player 1, 2, 3, etc).